Yesterday my daughter Ashleigh turned 31! Well, I did the grilling for the event and, as most of the guests, we enjoyed some good beers. My Honey Blonde Ale homebrew was well received in addition to other craft beer offerings. 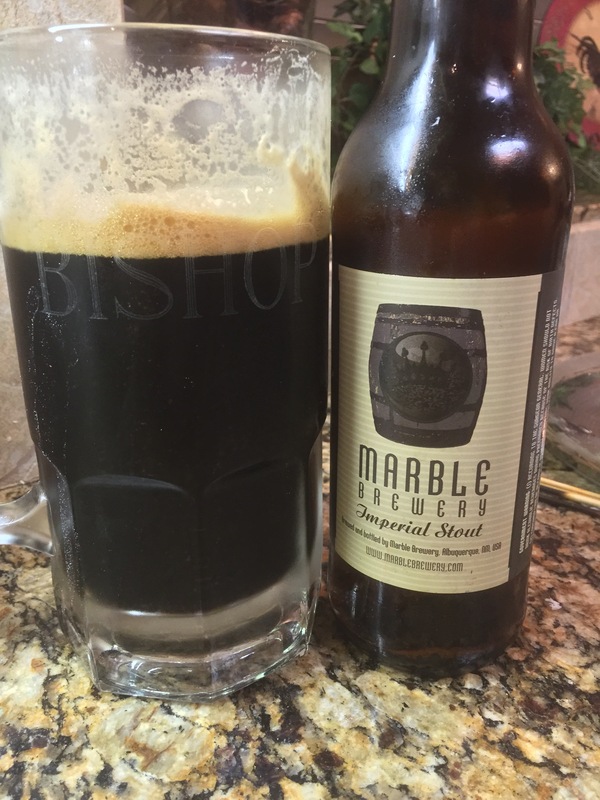 For this special night I broke out a bottle of an Imperial Stout from Marble Brewery in Albuquerque, New Mexico. What a great beer to help Ashleigh celebrate her 31st! Love you Ashleigh! Black as night, great head and very warming. We finished the evening sipping on my homemade Limoncello. I think that was a bit over the top for both of us! Very sweet, lemony and a hint of “Everclear” used for the base. It warms all the way down! I am getting pretty close to walking in my front door and getting the brewing area sanitized for the next batch of homebrew. I hope to boil tomorrow sometime. I just left Carlsbad New Mexico – yes that is in the good ole USA! Thursday night we sampled a meal at a restaurant called the Stock Exchange located in the “Old City Hall” at the corner of Canal and Fox St. Now don’t blink when driving around looking for it …. it is hard to spot. Lets talk beer. I asked our young waitress if they had any local beers and she told us now. After looking at the list I saw a “Marble IPA” – I decide to take a chance that it may have been brewed reasonably nearby. While she was of to grab my pint I searched for Marble Brewery on the iPhone and found that it is brewed in state, up in Albuquerque! I will put that in the category of local – if you have ever been to SE New Mexico, you will know that the distances are vast and local is just way too small. I will include Albuquerque in the category of local. The Marble IPA was outstanding!!!!! Beer Advocate had a 91 rating in the list. I am not schooled in the art but I do know what my mouth likes and this was top notch! Then I tried the Marble Red….it was good, is there really any bad beer? So many beers and so little time…..I may have to get down to the Flying Saucer this weekend and add some notches to my card….just three at a time. The meal started great…the cucumber gazpacho was refreshing and then the bite of some hot peppers grabs your attention….I liked it but it could overwhelm some. The cooks definition of medium didn’t match mine – medium well was delivered but a steak is a steak – unless of course it goes to well done! 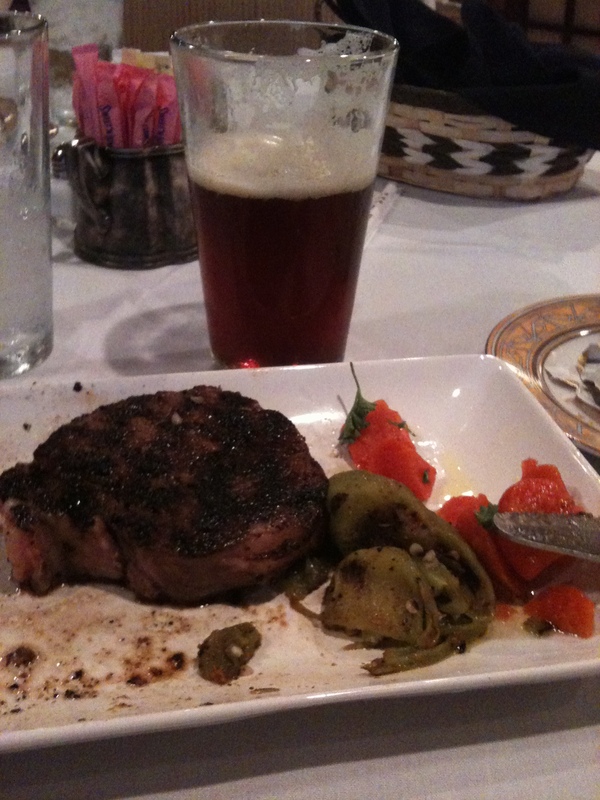 A steak, two roasted green chilis, glazed carrots and a Marble Red….Just it get any better?